How Friendly Are Multihulls? Very. The debate about monohull versus multihull is nuanced and never ending, but it really comes down to one thing. Multihulls are friendly. They don’t have their bows stuck up in the air or their hulls shirking off to one side. They stay level and inviting. They’re open and spacious for you and all of your friends, and they won’t let you down. You know that friend or family member who is really unsure and uncomfortable about getting on a sailboat? When they look at a traditional monohull leaning into the wind, they turn on their heel and head for the bar. Multihulls have spacious cockpits, flat floors, and spectacular views that make even the first-time boater feel at ease. Even those with a little sailing experience instantly cozy up to the feel of sailing a cruising catamaran. If you have someone in your life you want to convert into a sailor, try taking them out on a catamaran on a sunny day. Both of my kids have been raised living aboard our 44-foot St. Francis catamaran. We used to joke that the kids would have to purposely throw themselves off the boat to end up in the water. Of course my daughter tried that a few times in her toddler years (she’s fun that way), but the point is that the big deep cockpits and flat decks make it easy to mind little ones both at anchor and under way. Spacious salons make great play areas, with plenty of space for Lego creations and tea parties. And the beds are flat and easy to secure so your little ones won’t fall out. Speaking of beds, multihulls are baby making friendly, too. Many cruising cats have a “master suite” in one hull, allowing mom and dad to close off the whole hull for privacy. The master heads on larger cruising cats are spacious enough for two people to shower if the mood strikes. Even without a master suite, the port and starboard arrangement offers way more privacy for the couples trying to grow their own crew. And further into married with children life, when your spouse is on your last nerve, your kids are making you batty, and you have no way to escape the boat, you can stake a claim to your own hull. Cats have space to create a man cave, or simply sleep out on the trampoline netting to get a little peace and quiet. Not that kind of joint, sorry kids. I’m talking about the joints that start to give up on you as you collect miles under your keel. If your knees don’t always cooperate or your back is a little twitchy, then sailing flat might be your next move. Without the strain of keeping your body upright on a heel, your joints and muscles can relax and enjoy the ride. Older people, people with mobility issues, and those guests who are able bodied but show up in ridiculous high heels and might very well be hurting by the end of the day can all easily sail on a multihull. Whether it’s just you and the kids, or you bring the whole extended family, they will all fit happily on a cat. There is space for family game night, space for family movies, and space for all of the water toys that keep kids happy and busy. There is usually a larger pantry area to keep stocked up on snacks for everyone, too. If your family is the furry kind, multihulls are fabulous for critters. 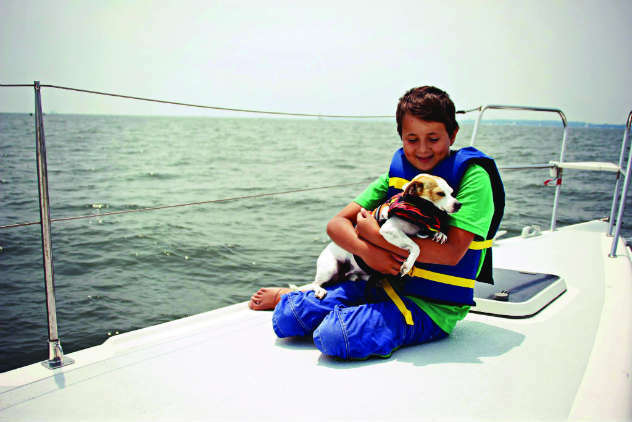 The wide decks make it easy for a sailing dog or cat to explore safely. Ample space below decks creates space to keep indoor animals such as hamsters, ferrets, mice, rats, hedgehogs, and lizards. You can also host big family get-togethers on a cruising catamaran. Thanksgiving with 10 or more people is no problem. Brunch out in the cockpit with visiting relatives can be done in style. 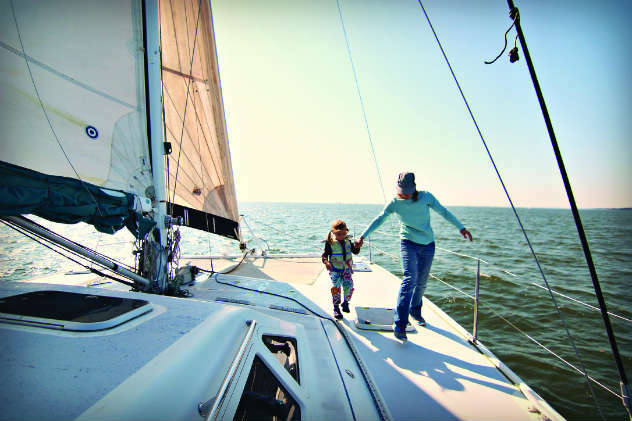 Big family sailing trips are comfortable and bring lifetime memories. 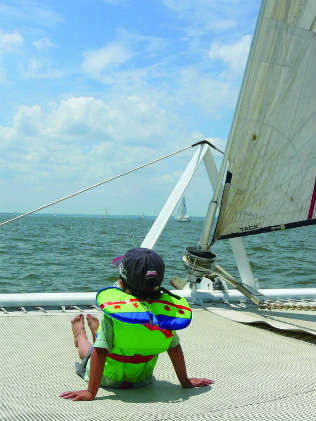 Did you know the average depth of the Chesapeake Bay is only 21 feet? And there is that old saying that a six-foot tall person could wade 700,000 acres of the Bay without becoming completely submerged? This is the place to explore with a shallow draft, and multihulls allow you to do that very comfortably. Twenty years ago it was a rare sight to see any kind of multihull out sailing the Chesapeake Bay. Now they are all over the place, as Bay sailors have realized the advantages of living aboard or sailing cats and tris all around the Chesapeake in season. Every gunkhole will have a multihull tucked into the shallow corners, protected from the weather and chop. The ability to get away from it all is what appeals to many introvert sailors. When an anchorage is full, multihulls can pull into the shallows and set the hook away from the crowds. Some cats are beachable, allowing owners to snug the bows onto the sand and have a little paradise all to themselves. But there’s a flip side. 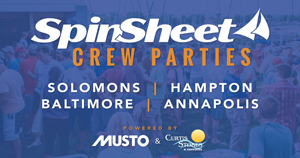 Most of us who sail in mixed mono-multi crowds know that if there’s a party, it’s happening on the cruising catamaran. Happy hours, jam sessions, play dates, and dinner parties almost always end up happening on and in the closest catamaran. 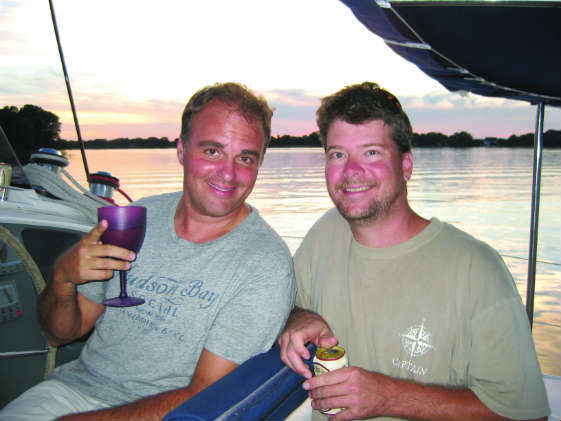 Friendly multihulls with friendly multihull owners will always result in a good time. This is the final installment of our 2018 four-part multihull series. Find part one of our multihull series here. Find part two of our multihull series here. Find part three of our multihull series here.